Marine biologists study a wide variety of aquatic organisms, from microscopic plankton to massive whales. Most marine biologists choose a specialty field such as phycology, ichthyology, invertebrate zoology, marine mammalogy, fishery biology, marine biotechnology, marine microbiology, or marine ecology. Specialization in studying a particular species also is common. Employers for marine biologists can include zoological parks, aquariums, governmental agencies, laboratories, educational institutions, museums, publications, environmental advocacy or conservation groups, consulting companies, the U.S. Navy, and the U.S. Coast Guard. What marine biologists do can vary widely based on whether they work primarily in research, academia, or the private sector. Nearly all marine biologists spend at least part of their time doing research in the field, working in environments ranging from marshes or wetlands to the ocean. They use equipment including boats, scuba gear, nets, traps, sonar, submarines, robotics, computers, and standard lab equipment. Marine biologists involved in research write grant proposals to obtain funding, collect and analyze data from their studies, and publish papers for peer review in scientific journals. Travel is a standard component of researchers’ lives. Marine biologists who teach have to prepare and deliver lectures, advise students, plan lab sessions, and grade papers and exams. Most professors also participate in research studies and publish their findings in scientific journals. Marine biologists in private industry may have more of a consulting role and are not necessarily involved with active research. The U.S. Bureau of Labor Statistics includes marine biologists in a broader category including all zoologists and wildlife biologists. 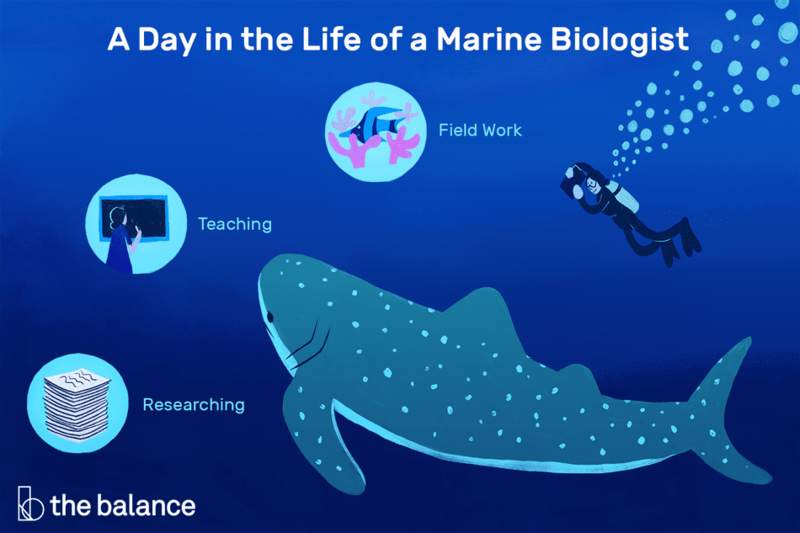 Independent research as a biologist typically requires a doctorate, so pursuing a career as a marine biologist should be expected to include having a Ph.D. or being on the path to earning one. Education: Aspiring marine biologists usually start with an undergraduate degree in biology before pursuing degrees at the graduate level. It's worth noting that an undergraduate degree in marine biology is not required to go on to study for a Masters of Science or doctorate in the field. Many students pursue a degree in general biology, zoology, or animal science before seeking an M.S. or Ph.D. in marine biology. When selecting a graduate school, as you would with any other graduate training, identify a program that offers classes and research in the specialty field or species that interests you. Your best bet is to read currently published research in the field to determine which professors are doing research in your area of interest. Apply to the programs where you can get the experience and guidance you desire. Courses in biology, chemistry, physics, mathematics (especially statistics), communications, and computer technology will usually be required as you pursue any degree in the biological sciences. Training: Internships are a common part of marine biology training, both at the undergraduate and graduate levels. Students often make plans to study for the summer or participate in hands-on research at institutes in California, Florida, Hawaii, or the Caribbean. Certification: If doing fieldwork that requires time under water, marine biologists should earn appropriate scuba diving certifications through the Professional Association of Diving Instructors (PADI) or other recognized certifying organization. Critical and analytical thinking: Drawing conclusions requires sound scientific methods, which requires questioning and testing everything. Observational skills: Studying marine life, especially animals, requires the ability to recognize the slightest changes in behavior and any changes in environment that might have led to those changes. Physical and emotional stamina: Fieldwork can be physically demanding, especially if it is done in or under water, and it also can be emotionally demanding if it requires the researcher to alone in an environment with only native marine life. Teamwork: Much research is done as part of a larger team. Students still working toward advanced degrees especially are expected to cooperate with other team members if they are assisting a professor or other team leader with research. The U.S. Bureau of Labor Statistics projects 8 percent job growth for zoologists and wildlife biologists for the decade ending in 2026. This is slightly ahead of the 7 percent rate projected for all occupations, but the National Oceanic and Atmospheric Administration’s (NOAA) Southwest Fisheries Science Center states that the outlook for marine biologists specifically is not as good. Government jobs are limited, according to the NOAA, and the number of marine scientists looking for work exceeds demand overall. Fieldwork often involves on boats or otherwise in or around water. Depending on the nature of the research, it can be physically demanding and may require being underwater in scuba gear at different times. In some instances, fieldwork potentially can be dangerous if doing research in areas shared by large or aggressive species. Some work can be done in a laboratory setting, and work can be mostly solitary once the fieldwork is done and numbers need to be crunched and papers need to be written. Marine biologists doing fieldwork often have the least conventional work schedules. Depending on the nature of the research, fieldwork might demand long hours and irregular intervals of time. Marine biologists who are teaching might also have class schedules or office hours that require working evenings. Working as a professor at a university with a marine biology program is one of the best routes to a career doing research. Fisheries or state and national park programs with access to waterways are possible career paths for marine biologists. Zoos or other water-themed attractions are good career options if the goal is to work with fish or marine mammals.